I read 6 books this week! 6! I know! I’m mildly revelling in this (probably first time) accomplishment…although, there are unfortunate reasons. I was sick. Therefore lots of extra reading time. I slacked on visiting blogs, though. But you peoples did not. I am so amazed and encouraged by the 100+ comments on my post about names in books. Just…WOW. And thank you! Every comment? I love. I do! I honestly do! You’re all special snowflakes. Also don’t forget that our Beautiful People link up for writers interviewing their characters is live! It’s open all month. So you can interrogate and terrorise your characters happily. I’m linking up with Tynga’s Reviews for the meme Stacking The Shelves! And also Caffeinated Book Reviewer for Sunday Post! Basically: you recount books you’ve won/bought/collected this week. Thanks Hot Key Books for As Red As Blood! Peoples, this is set in Finland! FINLAND! And it’s a thriller and the real cover (which I do not have but you can see on Goodreads) is absolutely beautiful. Need I say more? Allen & Unwin win Awesome Publisher of the Week award. THEY ARE THE BEST. I won The Year It All Ended. And then (surprise ARC package) came Fool Me Twice, Wish You Were Italian and We Were Liars. Now, to be honest…I’m not a chick-flick kind of reader. They mildly horrify me. But We Were Liars?! I have wanted to read that forever. And trust me, I threw aside all and just devoured that book the next day. It. was. mind blowing. Oh, and oh, do I have the bestest friends in the world. Charnell sent me Dangerous Girls. SHE JUST UP AND SENT IT TO ME. First of all…let me flail. Second of all: CHARNELL, YOU ARE THE BEST, OKAY? A small (very, very small) trip to my library gave me The Book Thief, which I confess! I watched the movie first. But it was freakishly brilliant and has just whetted my appetite for the book even more. (Are you happy, Lydia?! I got it!) And I borrowed Rebel Belle because it’s book-of-the-month for the Aussie Book Bloggers group. It’s set in Southern America, so it better have fried chicken is all I can say. sunday – We launched round #2 of the Beautiful People linkup for writers! There’s already 22 of us linked up, so go! Go! It’s open all month. tuesday – Cait reviewed Searching for Sky which made her snivel tearfully. wednesday – Want to know 10 of Cait’s deepest darkest bookish confessions? thursday – We interview the author of Razorhurst as part of the blog tour! friday – How do you feel when you stumble across YOUR name in a book? saturday – Mime and Cait discuss An Abundance of Katherines … well, basically we talk about pizza. But you can pretend it’s a book review. Awesome posts by awesome bloggers! I want to spotlight my friends marvellous genius, so go! go! Read them all! Lydia @ The Book Chewers made some of the drinks out of Harry Potter! Butterbeer anyone? Emily @ The Loony Teen Writer points out that star ratings are really awkward. Stephanie @ Chasm of Books talks about Book Panic. It’s a real thing. But you can deal. Kelly @ Diva Booknerd is giving away Four. Jeann @ Happy Indulgence has a 2nd Blogversary! Cake all round! Laura @ Laura Plus Books talks about commenting on comments. You have to watch this Harry Potter vs. Twilight DANCE-OFF. And Gandalf. Watch for Gandalf, because his line is priceless. Ohhh, have you seen the new cover for Half Wild (Half Bad #2)?? Because I am completely in love. And I’m sure you’ve seen it already (but who are we kidding? You want to see it again! )…there’s another Mockingjay teaser out. TEASER IS THE WORD, OKAY? It’s so, so hard to wait. I don’t usually have room to post all reviews on the blog…so I want to know what YOU want me to post about. Plus: deciding what to read is hard. You do the dirty work. That’s what you’re here for. don’t forget to link me to your weekend posts! have you read any of these books? because i want thoughts! opinions! please <– see my manners? also, anyone a little teeny tiny bit excited for Mockingjay?! Previous Post: « How Do You Feel When Books Use Your Name? Ohhhh, I wasn't expecting Rain, eh? It was so sad, but yes…almost happy. I nearly cried for the grandma actually. And poor Apple, is all I can say! XD I totally want to read Dangerous Girls next…so far the poll's tied with it and The Book Thief. Charnell is amazing isn't she? Oh my man, we LOVED that book, you must read it Cait, you must you must you must! Well done for reading 6 books as well, damn, I read like, techincally 2 and a novella this week and I have my read-a-thon starting next week, so I need to push myself tonight I think. THAT TRAILER DOE, I am SO EXCITE. Mockingjay was my favourite of the series, so I'm damn excited to see where this goes, YAY! Lovely haul, nice catch up, continue to be fantastic, okay? OKAY! YES SHE IS. And I haven't met anyone who didn't love it yet, so I'm 1000% sure I'm going to enjoy it. If I don't, I'll just bury myself forever. Hehe.BUT I KNOW RIGHT? THAT TEASER/TRAILER WAS NOT OKAY IN THE LEAST. Now I'm just hyperventilating in anticipation. When will they come out with the proper trailer though?!! Six books in a week is pretty good going! I hope you feel better now, though! 🙂 You need to read Dangerous Girls next. It is awesome!! I want to! So far it's tied in the poll. And yessss, I was happy with 6 books even if it was a sucky week. I was laid up a few years ago with a blood clot and on strict orders to not move from my chair-I read like 10 books a week out of sheer boredom :p Great job on getting through so many books and I hope you're feeling better! Ugh. That's worse. I'm so sorry! But yes, I know what you mean…it's basically like: what else shall I do? Stare at the wall? READ. Hehe, thanks. x) It was nice to play a bit of catch up though, because the books seem to be coming thick and fast at the moment. Ohhh, I need more time to read ALL THE CLARE BOOKS EVER. Maybe I'll pause in TMI and try TID? Read the simultaneously? I want to try anyway. I'm sooo excited for it! (And it's totally winning on the poll! XD) I loved the movie to pieces. YES YOU MUST READ WE WERE LIARS. I WANT TO KNOW WHAT YOU THINK. That's the problem with library books, though…darn return due dates. Why can't they just lend me the books forever? I'd take good care of them. There are 14 holds on the physical copy of We Were Liars and 9 holds on the ebook copy at my library! Noooooo! This is not fair! Why must I see all these rave reviews about this book, but not be able to get the book? The Book Thief is an amazing and beautiful book. Plus, it has unique formatting, which I know the Notebook Sisters approve of. I really hope you like it. Woah! Well at least you know it's THAT good of a book. XD There were 8 reserves on The Book Thief when I asked for it…but everyone must've returned their copies, because I sure got it fast! *flips villainous cloak and stalks around* Yes yes, you are here to serve me, my minions. I'm a little teeny tiny bit Italian, so I'm intrigued by that title too. So long as there's pasta. My love for pasta is deeper than the Mariana trench. Six books this week is impressive. I hope you love all your new books this week. They all look amazing. They are beautiful and magnanimous to look at, yus. FUN? I THINK: PAIN. THAT'S THE WORD YOU'RE AFTER. Wish You Were Italian and We Were Liars look so good! I hope you enjoy all you got :)Here's my STS! You're making me curious about We Were Liars! Enjoy the ones you haven't already devoured! SIX BOOKS? Wow. I've been having a hard time reading this week, and you go and read six. Sorry you've been sick, though. That always blows. I'm not a chick flick kinda chick either, but I thought Wish You Were Italian was pretty cute. And We Were Liars…that was a crazy book, right? I loved it, I loved that I didn't see that coming. So awesome! The movie for The Book Thief was great, but it's nothing compared to the beauty of the book. Just wait for the writing-style <3 Happy reading! *squeals enthusiastically and dances in circles* EEEP! YOU ARE FINALLY READING THE BOOK THIEF! XD I'm excited to hear what you think of it! I will be here for all the virtual hugs you need and to offer a virtual shoulder to cry on. I'm glad you liked Of Triton I've been on the fence about reading it, but I did like Of Poseidon. I was unsure about reading We Were Liars but you may have convinced me to give it a chance! 😉 Have fun reading! Oh, The Book Thief. You must read that next. I am currently half way through it. (I know it's taking me a while, but it's so beautiful. )I haven't read any of the other books you were talking about, but six in a week is impressive. That's why sickness has its good points. YUSS MOCKINGJAY! AND BEETEE! I love him.So my sister is reading The Book Thief right now (second bout of book jealousy for me this year), and once I finish my current book (The Golem and the Jinni) I will steal it away from her… She says it is just spectacularly awesome. EVERYONE says it's spectacularly awesome. Ohhh, good! I'm kind of keen because a) book club and b) who doesn't like some American southern sass? We Were Liars is amazing. Like oh-I-cannot-believe-it-is-like-this amazing. Damn girl! You're so lucky c: I personally adored Dangerous Girls, and I feel like you will too. It really appealed to my aspiring lawyer side AND OMG YOU WON'T BE THE SAME AFTER THAT ENDING. 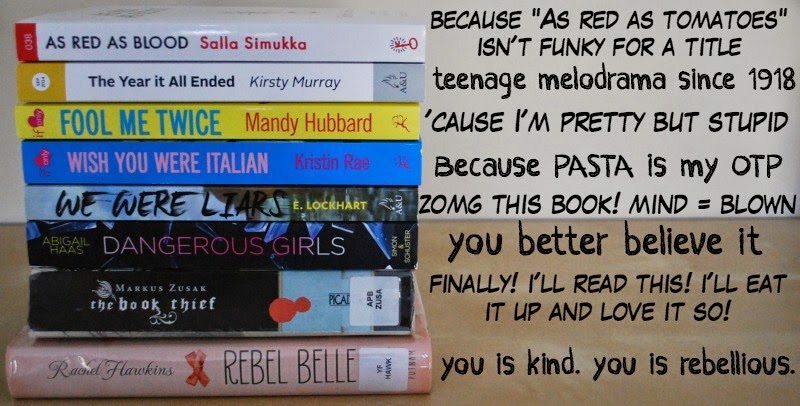 haha[; Rebel Belle was such a fun and light read c: I LOVED the main character, she was the inspiration for my blog pot regarding characters that aren't strong in the typical way. She's definitely girly and such, but I still found herself to be strong in the way she carried herself and her high achievements. I've never heard of The Program before. However, your 5 star rating has definitely made it on my TBR. Honestly I'm not a huge dystopian fan, but the fact that in your review you said you personally wouldn't self it under that actually makes me want to read it more. I KNOW I AM. *cuddles luckiness while still has it* I'm just so so excited for Dangerous Girls. I was devastated because my library didn't have it and then BOOM, Charnell sounds me this surprise. x) I know the most awesome people in the world. Your blog "pot", eh? Now, now, Larissa, are you reading or smoking….x)You hadn't heard of The Program? SERIOUSLY I RECOMMEND IT WITH A THOUSAND SHINY STAR STICKERS. Wish You Were Italian is such a cute name! I haven't read any of the titles you got :/ but I've heard great things about We Were Liars. Looks like I need to bump that one up on the TBR! We Were Liars is gold. But I agree Wish You Were Italian sounds cute. Hehe…cute's not always my thing but I DO love pasta. I was totally getting my nerd-rage on and go off and IT'S FREAKING DUMBLEDORE, but then I watched the video and O_O Makes so much sense now. Also: what is my life that I'm watching breakdancing Harry Potter? I need to go question my life choices. Omg, you thought I made a mistake?!! HA HA. Nope. x) I'm good, too good. But seriously breakdancing Harry Potter just COMPLETED your life. You know it did. I have too many things to comment on! AH. Okay: Holy CRAP, 6 books!? That is amazing! I am sorry you were sick, but still….. 6 books! Also, I did the same with Instagram. Swore up and down I'd never cave (I just added you; obviously I caved). You have just convinced me that I must go directly to We Were Liars after Ruin and Rising. Do not pass go. And MOCKINGJAY <3 <3 <3 Need I say more? Thanks for giving me another excuse to re-watch 😉 And I voted for you to read As Red As Blood so I know if I should read it basically. Purely selfish motives there. Enjoy the books!! Oh my goodness, I hadn't seen the 2nd Mockingjay trailer yet!! SO EXCITED!I read Dangerous Girls ages ago, and I'll admit, it did stop me from sleeping for a bit…I LOVED The Program. So sad and depressing, yet SO GOOD.I finished Of Poseidon at 5am this morning…I'm excited for the next one, but now I'm worried…I've ordered Rebel Belle at my local bookshop…just waiting for it to arrive. OH YAY! I'm excited! I figured if I loved the movie then the book could only be better, right?! And We Were Liars…I recommend it a billion times. Finland makes me excited because I don't read a lot of foreign books and I want to! I want to know about places like Finland!! This is aaaawesome to know. x) I'm going to have so much fun and feels and horrible tears, I just know it. *bows* I'm 99% sure I'll adore the very cover off it. And plus I know the sequel is lurking out there, which is doubly exciting. x) AND I KNOW! I KNOW! YOU'RE ALWAYS RIGHT. I'm nervous because I knooow the cliff-hanger is going to be horrible and then what? Another WHOLE YEAR to wait until it gets resolved?? I'm going to cry. It's so whooping the poll that's for sure! XD I'm going to read it slowly though, because if I read books too fast I don't like them as much. SLOWLY, CAIT, SLOWLY. Oh but 2 books a week is still awesome, because that's 100 books a year, right?! Rebel Belle looks pretty fantastic and We Were Liars = OMG ALL MUST READ THIS BOOK. I will. I'm pretty sure. I admit, I was kind of hoping Katniss' face would flash up there in the end too, BUT WHATEVER. BEETEE!!! Ohhh, we can compare thoughts on The Book Thief, then, right?!! Haven't seen the Book Thief yet, but I've read the book. Hope you enjoy! Thanks for stopping by. Everyone seems to swear by it, that's for sure. I am so happy that you loved We Were Liars – such an emotional book. LOL, I thought that I'd never have Instagram profile too and look at me now – I am addicted. Hm, someone should create "follow all bookbloggers on Instagram" challenge or something like that. 🙂 Happy reading and have a great week! Six books in a week is great! Sorry you were sick but sounds like you used your time well! I'm next in line for We Were Liars at the library and I can't wait! Looks like you got some interesting books from the library this week. A few I've heard of and a few I haven't that look intriguing. Have a great week! Ooh, I hope you like We Were Liars when you get it! AH HA! I SAW YOU ON TWITTER. I'm definitely reviewing it, so let's see. 😉 I'm so not keen for Fool Me Twice. -_- Chick flicks and me have such a meh relationship. Dangerous Girls on the other hand….YES. I'm excited! Awesome! Six books….I read four and thought that was pretty good for me, since I am so easily distracted.I have not yet read The Book Thief, and the movie is On Demand…tempted! I have We Were Liars…and must read it soon! Thanks for sharing and for visiting my blog. I usually read 4 a week and I'm always happy with that. 🙂 I get easily distracted too, though, yes! That's why I haven't read TBT yet because it's sooo huge. We Were Liars, holy crap. Book of the year, easily. How are you going to review that one? I'm really struggling to put anything coherent down.How the bloody hell are you reading six books in a week? That's an incredibly achievement in it's self, and those aren't all short little books either.So glad you loved The Program, I absolutely adored it. Really unique. IT IS THE BOOK OF THE YEAR! Huzzah! I'm reviewing it like in lists of useless things I like about it which will be entirely random and hopeless and my readers may throw things at me. But I have armour. I'll be okay. Ah-hah! YES. They weren't all teeny tiny (well, We Were Liars was) so I feel very happy with myself. Let me strut. Dangerous Girls is AMAZING! Probably one of my favorite reads last year. Enjoy your new books! I'm so so excited for it!!! I'm glad you ended up loving We Were Lairs! It totally messes with your mind right?! Also, I love The Program, too!! I need to get reading The Treatment! (I love Jamessss). I need to read Rebel Belle still, heard it was a pretty cute read and I loved Hawkins' Hex Hall series. Hope you enjoy your new books! Ugh, yes, my mind is absolutely messed. 🙁 I want to read The Treatment now for sure, although I heard it wasn't as good? James made me sob. I need to read Dangerous Girls, I have it out from the library! It looks so good, enjoy!-Scott Reads It! I'm waiting for Mime to finish Of Neptune so I can read it…WAITING WAITING. x) So I know your pain…hehe. How do you read 6 books in a week?! I've been reading City of Heavenly Fire for more than a week now and I'm still not done. But yeah, TMI is amazing!You should definitely read The Book Thief next. I read the book first but didn't finish it because the pace was so slow in the beginning. Then I watched it and totally loved it. So I read it again. The pace did pick up after a few chapters. It was really good. Nice stack this week. And I agree with you the Of Poseidon series took a dive.Thanks for stopping by. Sad, isn't it? I had huge hopes for that trilogy, particularly when I rated the first 5-stars. You being on instagram is probably going to be pretty epic!!! Wow 6 books in a week!? I wish I had the motivation to read that many. Good job! I get easily distracted when reading, unfortunately. I've only got rebel belle from that big stack! Wow, you read a lot last week! So glad you loved The Program. This has been on my wishlist for awhile. Once I get some more free cash I think I will have to go get this. I hope you enjoy all you new books. Happy Reading! Here are my new additions.